The clothes in the dryer tumble round and round as my thoughts do the same. Grandpa fell today. Grandma fell a few weeks ago. They are in their 90’s and in assisted living. My parents still provide much of their care. I try to visit often. To run errands. To bring treats. To share love. But can get complicated. And hard. The oven timer rings capturing my attention. A family member going through a long and drawn out custody battle. It should have never come to this. But it has. She is so young and so innocent. What’s best for the child…it’s not always what happens. And there are extenuating circumstances. This too is complicated. And hard. The tea kettle whistles its warning. My heart aching for loved ones struggling with addiction, with anxiety, with depression. Do they know they are loved? There is Hope? There is healing? I wonder how I can best help, best love. Again complicated. Again hard. And prayers. So many prayers. The dryer has stopped turning and the oven timer shut off; the tea kettle removed from the stove and a steaming cup is brewed. Hot tears are near the surface as I savor the silence and the steam of the cup. Life IS complicated. Circumstances ARE hard. But God…our ever-present hope in times of trouble. He is bigger than it all. Wisdom in the complicated and merciful through the hard. 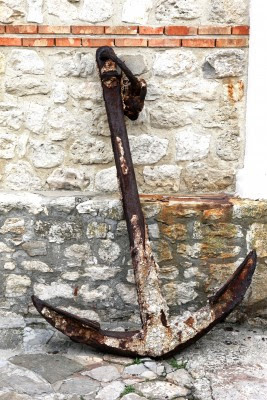 An anchor for my soul. Amen! Love this reminder. I can so relate. Thankful for that Anchor! Thanks for stopping by. He is bigger, yes, but sometimes we still feel as if we are being swallowed.